These are our picks for the “30 Most Influential Female Hunters in North America,” as of July 2018. Although it’s organized alphabetically by last name, additions and other changes to this list are determined by a proprietary algorithm developed by Wildlife Enthusiast Magazine. That algorithm measures not just the number of followers, friends, and fans on social media, but—more importantly—activity levels, engagement, and influence. Congratulations to each of these impressive women! Mia Anstine inspires many other women to get outside, hunt, fish, shoot, and survive life. 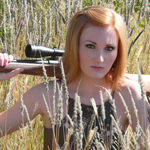 She is a certified firearms and archery instructor, as well as hunter education instructor. Mia strives to preserve our constitutional rights with a focus on freedom of religion and the right to bear arms. She also works to continue traditions passed down from generations before with an emphasis on conservation. Mia was the first American woman of Latin descent to be featured on the cover of Field & Stream magazine. Alongside 10 other women featured, they are “boots on the ground” representatives of the many women who are making a difference in the outdoor industry. After graduating from college with honors and armed with a degree in television broadcasting, Melissa Bachman set her sights on a career in outdoor TV. She began as an intern and was soon offered a position as a full-time producer, where she traveled the country, producing shows with a variety of incredible hunters on some fantastic adventures. In addition, Melissa spent every spare moment of her free time arduously filming and editing her own hunts. Now she spends nearly 250 days a year in the field, hunting around the globe and producing her series, “Winchester Deadly Passion,” a top-notch, adrenaline-pumping hunting show on the Sportsman Channel. Brittany Boddington’s hunting career began after high school when, as a graduation gift, she went on her first safari with her father, taking five trophy animals. She has since become a passionate hunter and conservationist and now spends most of the year happily living out of a suitcase in pursuit of exotic animals and exciting adventures. Brittany writes for several notable outdoor publications, including Peterson’s Hunting, Sports Afield, Wild Deer Magazine, and Guns & Ammo. She was honored as the first woman to ever appear on the cover of Peterson’s Hunting and also was featured in the book The Diana Files: The Huntress-Traveller through History by Fiona Clair Capstick. Nikki Boxler grew up on a large dairy farm in Western New York. Nikki’s dad introduced her to hunting and fishing when she was young, and Nikki quickly embraced the lifestyle because of the camaraderie and bonds she experienced among fellow hunters. It is this setting that helped to shape her love for the outdoors—a passion that drives her to spend as much time hunting and fishing as possible. Having worked in male-dominated industries her entire life, Nikki now strives to empower and motivate other women to break stereotypes and chase their dreams. She learned firsthand how being active in the great outdoors can change a person’s entire outlook on life. The outdoor experience has always been a part of Kathryn Brown’s life. She enjoys hunting, fishing, hiking, boating, and many other nature-loving pursuits along with her husband, Ken Brown. The couple also shares their passion for the outdoors with their young son, Zane. Kathryn and Ken treasure the memories they have created together, as well as handing the tradition of hunting down from one generation to the next, including discussions about wildlife conservation, connecting to the outdoors, and developing life skills. Kathryn and her business partner, Jody Simpson, are the founders of High Heel Huntress, purveyors of upscale camo clothing for women. Gina and Jon Brunson truly are “Addicted to the Outdoors.” Between filming and producing their TV show by the same name, running multiple companies, and engaging their passion for the outdoors, the busy couple somehow also finds the time to raise six children. Growing up, Gina and her sister spent most of their childhood in foster care, eventually adopted by a family who took Gina camping and fishing. That planted the seed for Gina’s love of the outdoors, and for instilling that love in her kids. For Gina, the true majesty of hunting doesn’t lie in downed game, but in watching her offspring learn to value the outdoors as much as she and her husband do. Jessica Taylor Byers is aggressively chasing a seemingly impossible dream that’s slowly becoming her reality. Jessica has hunted most of her life, but it wasn’t until her husband put a bow in her hand that she noticed a passion evolving. Jessica’s motivation stems from the ability to inspire women and younger generations, and she’s forever grateful to see her audience expand every day. Jessica aims to show transparency in terms of the dedication, missed opportunities, emotions, and gritty details that are often pushed aside when it comes to hunting. The truth is that there’s power in being vulnerable, because it allows acceptance of both the good and the bad. To Amanda Caldwell, hunting is not defined by an animal downed; rather, it is the purity of the challenge and the connection created with nature. Hunting is about sustenance, survival—and ultimately—life. Amanda is a real estate agent and bowhunter from Bozeman, Montana. She has been blessed to harvest elk, deer, antelope, bear, and small game throughout her life. In addition to time spent hunting on horseback in the mountains, Amanda’s life’s work revolves around being a positive role model in her home, church, and community. She is a firm believer in promoting wildlife preservation and protecting our natural resources. 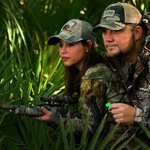 Vicki Cianciarulo is an experienced bowhunter, enthusiastic nature photographer, the better half of “North America’s Favorite Hunting Couple,” and co-host of the award-winning “Archer’s Choice” and “The Choice” TV shows, alongside her spouse, Ralph Cianciarulo. Vicki has earned the title of taking the largest wild whitetail deer by a female on camera. She also has to her credit numerous black bears, caribou, moose, dall sheep, whitetails, mule deer, antelope, a turkey Grand Slam, and much more. Vicki’s history includes outfitting and guiding for both bear and deer, serving on several wildlife conservation boards, and editing and producing TV shows. A veteran huntress residing in Jefferson, Colorado, Randi Clark works as a park ranger and has more than nine years experience in hunting. Randi was always active in the outdoors as a young girl. While studying animal behavior in college, she decided to put her new skills to use by taking up hunting. Randi started off duck hunting and over the years has expanded into bigger game, ranging from elk, moose, and even mountain lion. She now spends her free time practicing shooting rifles, raising hunting dogs, and cooking wild game. Randi believes that if you’re a woman who also is a hunting enthusiast, you have an obligation to help introduce the outdoors to other ladies. 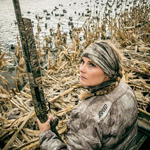 Kristy Lee Cook is one of the most well-known members of the Browning Pro Staff Team. Kristy first gained fame as a top 10 finalist on the 7th season of “American Idol.” With an intense love for country music, horses, hunting, and the great outdoors, her energetic, girl-next-door approach perfectly epitomizes the country lifestyle. Kristy is an avid barrel racer, and she actively competes at events nationwide. A talented actress and sought-after model, she also is an accomplished TV personality. As one of the stars on “The Most Wanted List” on Sportsman Channel, Kristy, her co-hosts, and their guests tackle their ideal hunts, checking them off the list one by one. 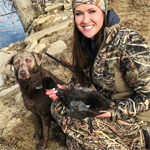 A native of southern Missouri, Andrea Crider is an avid bow and rifle hunter and the founder of Huntress View, a place where women can go to gain insight on hunting and shooting from a woman’s point of view. Andrea has recently started taking her girlfriends hunting and bow fishing for their first time. Some have told her they preferred learning about hunting from another woman, rather than from a man. 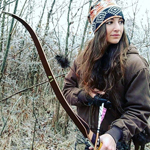 Andrea feels that more women will become involved in hunting and the outdoors if they are able to get advice from real female hunters and know what hunting products they are using and loving. By giving tips and honest feedback on hunting products, she hopes to help introduce more women to the great outdoors. Nikita Dalke is a passionate hunter and wildlife enthusiast. Nikita enjoys being outdoors with her husband and their two kids. Together, they enjoy hunting, hiking, backpacking, fishing, and camping as a family. Nikita is a proud member of the Wild Sheep Foundation, BC Wildlife Federation, 2% for Conservation, and she is a Director for the BC Chapter of the Backcountry Hunters & Anglers Association. Nikita hunts with a rifle and a bow. Her favorite place to be is in the high country up in the alpine. Nikita is especially fond of the Kootenays in which she resides and the abundance of wildlife that lives in the area. She finds unique beauty and a sense of peace in the remoteness. Growing up in Pittsburgh, Allie D’Andrea never fully grasped what public lands were or why they were important. Allie grew up very much in the outdoors, but she didn’t start hunting until the age of 19. 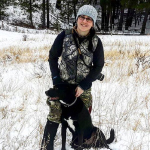 Shortly after finding her passion for the hunt, Allie landed an internship with a hunting apparel company, so she packed up and moved to Idaho. Hunting and angling in the West is where Allie learned the importance of public lands and grew to love them deeper than anything else she’d ever experienced. 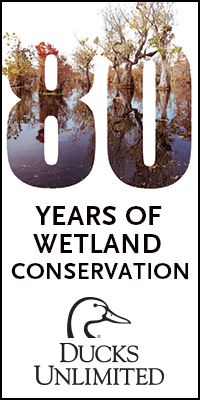 Allie is passionate about conserving these lands for current and future generations. She also is one of the founders of Artemis, a group of bold sportswomen who are creating fresh tracks for conservation. Taylor Drury is no stranger to the outdoor industry. Taylor watched her father, Mark and her Uncle Terry build the family business from a dream to an award-winning TV company over the past 20 years. By presenting herself as a fearless female hunter on and off camera, she is now an established public figure amongst young, female, and veteran hunters. 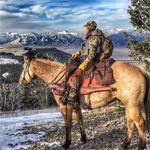 Through promoting ethical harvests and respectful hunting tactics, Taylor has helped Drury Outdoors’ social media accounts become some of the most viewed in the outdoor industry. And after more than a decade of success as an archery and gun hunter, Taylor was recently made a cast member on the TV sensation, Bow Madness. With the help of foundation sponsor Smith & Wesson, Deb Ferns launched the women’s action shooting camps, Babes with Bullets, which have been held across the country since 2004. 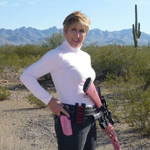 Since then, she has introduced more than 5,000 women to firearms. Deb also is the Executive Producer of the Babes with Bullets webisodes, hosted at OutdoorChannel.com. 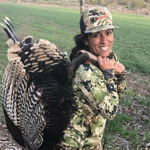 She now has created another women’s program called Ladies Adventure Camp Experience (LACE), which focuses on hosted turkey, hog, and elk hunting adventures, as well as trout fishing trips. On top of all that, Deb is a board member of the Women’s Outdoor Media Association and a motivational speaker. Born and raised in northern New Jersey, Beka Garris grew up hunting and fishing with her dad, brothers, and sisters. Even at a very young age, Beka loved virtually everything about the outdoor world, as there was always some adventure to be found on the public lands where she spent most of her time growing up. Beka currently lives in Ohio with her husband and strives to live the outdoor lifestyle through hunting, fishing, bowfishing, gathering, and farming. In the past few years, Beka has become interested in traditional archery, and now she hunts almost exclusively with longbow and recurve. Beka loves to cook, write, and share her outdoor adventures with others through social media. 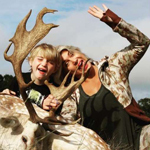 Norissa Harman is the co-founder of the iconic outdoor fashion line, Girls with Guns (GWG) Clothing. Launched in her garage with best friend Jen O’Hara, GWG was born out of a dream and fashioned through a partnership that’s one part risk taker and one part conservative. GWG is located in beautiful Northern California, between Redding and Chico, a few hours south of the Oregon border, in the small town of Red Bluff. Before starting GWG, Norissa spent many hours hunting alongside her husband, but also with Jen. These days, Norissa and Jen are learning to shoot defensively with pistols, after spending time afield and abroad, hunting and shooting all types of game for their popular TV show, GWG TV. Born to a family of hunters, Haley Heath’s love with hunting started at an early age, and it wasn’t long before she took her first deer at the age of six. Since then, Haley has traveled the globe and hunted all types of game. Her first TV show, “Family Traditions with Haley Heath,” premiered in 2008 on The Sportsman Channel. Now a mother of three and a member of “Women of Weatherby,” Haley continues to share her knowledge and passion for hunting with others. Recognized for her passion for conservation in the Wall Street Journal, USA Today, and the Washington Times, Haley is helping to turn a sport once viewed as a privilege for the elite into an activity every member of the family can enjoy. Kandi Kisky co-owns Whitetail Freaks TV with her husband, Don. 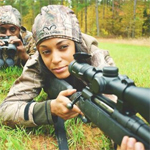 Kandi started hunting when she met Don back in 1990. Since that fateful day, she’s taken numerous large bucks. Kandi and Don are farmers by trade and cherish the simple family life that comes with living in Iowa. They have a son named Kaleb who loves the outdoors as much as his parents and is now an accomplished hunter. They also have a daughter named Kailee who will be tagging along in the woods before you know it. Kandi has been featured in various hunting publications, and you can see her hunts on Whitetails Taking it to the Extreme, Whitetail Country, Realtree, NAW Television, She Safari, and of course, Whitetail Freaks TV. As the popular TV hosts of Outdoor Channel’s top-rated, award-winning “Crush with Lee & Tiffany,” Tiffany Lakosky and her husband have blazed a trail within the outdoor industry, proving that hard work, perseverance, dedication, and skill can accomplish anything. As an airline attendant, Tiffany had seen the world, but she longed to take her love of the outdoors to the next level. When she wanted to try archery, she turned to Lee, who was following his passion and working at an archery shop. As it turns out, Tiffany was a natural with a bow, so after getting married in 2003, they moved to Iowa to begin their land management and whitetail dreams. And the rest, as they say, is history. With dedication, hard work, and determination—plus a focus on fitness and outdoors skills—Amanda Lynn Mayhew has embraced her passion to launch a career. With her positive, energetic personality, Amanda Lynn is quickly becoming one of the most accomplished and popular faces of the outdoors. 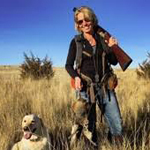 Supporting people in pursuit of their hunting heritage, she founded the “Range Day,” “Take Me Hunting,” and “Take Me Fishing” outreach programs, which are designed to help new adventurers get out there and get started. Amanda Lynn also is the host of “Just Hunt TV,” which airs on Wild TV. In addition, she is the official ambassador and host of the Great Outdoors Stage for the Toronto Sportsmen’s Show. Jen O’Hara is the co-founder of the iconic outdoor fashion line, Girls with Guns (GWG) Clothing. Jen is a Mossy Oak Pro Staffer from Northern California. Although she currently resides in Red Bluff, California, Jen is originally from Adin, California, a small town in Modoc County that boasts a population of 400 people. While she grew up in a family of hunters and outdoorsmen, it wasn’t until Jen was in her late 20s that she had the opportunity to hunt and fill her own tags. She was given the opportunity to hunt Northern California blacktail, and she successfully harvested a beautiful mature 3x3 blacktail. With a well-placed shot at 65 yards, Jen’s love of hunting and her passion for wildlife conservation were born. A noted hunter, outdoor enthusiast, TV chef, author, speaker, and creator of Adventure Getaways, Georgia Pellegrini leads women on trips that feature a variety of rugged outdoor activities. In 2011, Georgia was the second woman ever to appear on the cover of Shooting Sportsman Magazine. In her latest book, Girl Hunter, she writes about the experience of traveling around the U.S. and abroad to hunt her own meat. Georgia teamed up with veteran hunters to add to the adventures. It was named one of the “Top 10 Sports Books of 2012” by Booklist, a “Best Book of the Month” by Amazon, and was lauded in reviews by Publishers Weekly and the Wall Street Journal. 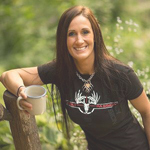 Kirstie Pike is the founder and CEO of Prois Hunting & Field Apparel for Women, which was the first major company to design and sell hunting clothing specifically for females. Based out of Gunnison, Colorado, Prois has become one of the foremost manufacturers of women’s hunting and outdoor gear in the U.S. Under Kirstie’s leadership, the company has grown significantly through innovation and creativity. 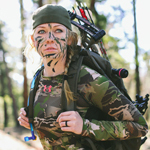 For example, Prois recently partnered with Veil Camo—the leader in scientific-based camo pattern innovations—to introduce the new Cumbre pattern, which has already become a huge hit with female hunters all across North America and beyond. Nicole Reeve was taught how to hunt by the person she looked up to the most, her father. At the ripe old age of six, Nicole shot her first deer, and since then has put many record book animals on the ground. Her personal best is a 195″ whitetail deer from her home state of Illinois. Nicole graduated from Southern Illinois University and was in her first year of teaching elementary school when her path crossed with that of her future husband, Pat. They subsequently joined together to make up one of the strongest, most dynamic teams in the hunting industry. 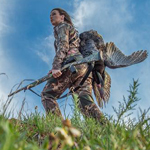 Nicole’s drive has never waivered since the beginning and has lead her and her husband to the top of the ratings chart on the Outdoor Channel. Bri Van Scotter is a hunter and professional wild game chef. Bri is currently the host of “Wilderness to Table with Chef Bri,” a new TV series that takes the viewer along on the hunt and ends with delicious recipes using hunted wild game. She is a French-trained chef and pastry chef and has worked in some of the best restaurants throughout the United States. 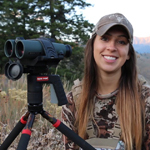 Bri’s passion for the outdoors and better ingredients led her to hunting. Noticing the lack of wild game recipes, she created her website, “Wilderness to Table,” solely to showcase the beauty of wild game through chef-inspired recipes. Bri also is the field and wild game cooking editor for Ballistic Magazine. Eva Shockey has co-hosted “Jim Shockey’s Hunting Adventures” on Outdoor Channel for the last decade, alongside her father, Jim. Eva also has appeared on ABC’s Nightline and the Fox Business Network as the “new face of hunting” and was featured alongside country music sensation Miranda Lambert in an award-winning Ram Trucks commercial. Eva became the second woman to ever grace the cover of Field & Stream magazine, almost 40 years after Queen Elizabeth was featured in 1976. And Eva’s new book, “Taking Aim,” is a memoir of adventure, skill, healthy living, and finding one’s true life calling. It tells Eva’s story of her journey from non-hunter to hunter and reached the top 150 books on Amazon. Tatiana Whitlock’s lifelong interest in martial arts resulted in the inevitable introduction to firearms as a means of self and home protection. That led to Tatiana’s devotion to firearms training, hunting, and wild game cooking. She now works with women, men, and youth to establish a real-world foundation of firearm skills, safety, and situational awareness. Tatiana believes that the joys of hunting involve a measure of patience and attention to detail, and that the same can be said for the careful preparation of the wild game you harvest. And just like hunting, a good meal is worth the wait. Tatiana is a featured host and instructor on Trigger Time TV, airing on the Pursuit Channel. Lakeisha Woodard and her family farm soybeans and wheat in the Mississippi Delta. When they’re not in the fields, Lakeisha and her husband are focused on raising their four beautiful children with a respect and appreciation for the outdoors. Through HALO Chronicles, they enjoy documenting their hunting adventures together as a family. Being more than just your average whitetail hunter, Lakeisha actively engages in deer hunting with a scientific approach through her work with Hunt Fish Journal. She and her husband also are pro staff members for C’Mere Deer, Swhacker, Browning Trail Cameras, Vanguard Outdoors, TenPoint Crossbow Technologies, Tactacam, and Easton Arrows. If you know of an influential female hunter who should be considered for addition to this list, please let us know.